Hilton and Parc 55 Wyndham are both sold out. 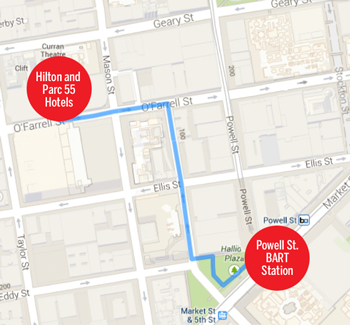 There are many additional hotel options in the Union Square area and near Bay Area Rapid Transit (BART). www.bart.gov The closest BART station to the Hilton/Parc55 is on Powell Street, about a 5 minute walk. We recommend checking with the host hotels first and then visiting one of the hotel information sites below to search for and secure a room reservation. The 2014 Annual Meeting will be held at both the Hilton San Francisco Union Square and the Parc 55 Wydham San Francisco. Registration, plenaries, keynotes, exhibits and interactive sessions will be held at the Hilton. Technical sessions will be held at both hotels. The Parc 55 Wyndham is just two blocks from the renowned Union Square shopping area and theatre districts, within walking distance of the San Francisco Museum of Modern Art and the Yerba Buena Gardens and just a few blocks from the Moscone Convention Center and Financial District. The Hotel is adjacent to the Hilton San Francisco Union Square and across the street from Hallidie Plaza with easy access to the world famous cable cars, BART (Bay Area Rapid Transit) and Muni. To make reservations online please click here. For telephone reservations please call 415-392-8000. A limited number of rooms have been blocked at the special INFORMS rate. We anticipate that rooms will sell quickly and advise you to make reservations early, well before the cut-off date of October 6. After that date, reservations will be accepted at prevailing rates on a room available basis. Cancel Policy: A credit card is required at the time of reservation to hold the room. The card will not be charged at the time of reservation. Cancel prior to the 72 hours of arrival with no penalty. If cancelled within 72 hour window prior to arrival a charge of full room and tax for the first night will be applied to the credit card on file. The Hilton San Francisco Union Square is located in the heart of San Francisco just off Union Square. The location is very convenient and an ideal spot from which to enjoy the many exciting attractions and neighborhoods that make up the city. It is in walking distance to: Chinatown, Nob Hill, Japantown and North Beach. Enjoy world class shopping, the famous Cable Cars and a wide variety of the finest restaurants in the world. The hotel is just blocks away from the BART transit line, Powell Street Station, which is a great transportation alternative to and from the San Francisco or Oakland Airports. To make reservations online please click here. No discount code is needed but reservations must be made through this link in order to get the discounted rate. Cancel Policy: In order to confirm a room assignment, the Hilton will require a first night’s deposit, refundable up to 72 hours in advance of your arrival date. Checks and major credit cards are acceptable to establish prepayment. All credit cards used to prepay will be charged immediately. Email the following information to meetings@informs.org : your full name, organization, gender (male or female) and dates of reservation. Periodically, we will email the list to all individuals who have signed up. It is the user’s responsibility to then contact others on the list to determine compatibility for room sharing and make all necessary arrangements, including hotel reservations. INFORMS is providing this service solely as a service to meeting attendees and is not responsible for information provided. INFORMS disclaims all liability arising out of participants’ use of the list, including, but not limited to, theft, injury and room charges/expenses. INFORMS makes no representations regarding the truthfulness of the information appearing on the list or regarding the users of the list.